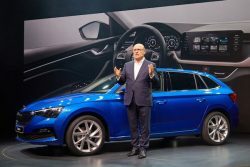 The curtain is up for ŠKODA’s new compact model: the new ŠKODA SCALA celebrated its world premiere in Tel Aviv this evening. The more than 400 guests at the presentation and a massive online audience heard that Compressed Natural Gas (CNG) is one of the options. With a new character, new technology and a new name, the ŠKODA SCALA completely redefines the compact car segment for the Czech brand. The fitting name ‘SCALA’ comes from the Latin for ‘stairs’ or ‘ladder’. The hatchback combines an emotive design with a high level of functionality as well as state-of-the-art connectivity, and transfers the sensational design language of the VISION RS concept study into a production vehicle for the first time. The SCALA offers a high level of active and passive safety, full-LED headlights and tail lights, plenty of space for luggage and passengers, as well as numerous Simply Clever features. It will be launched on the market in the first half of 2019. 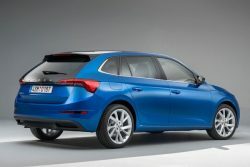 Although petrol and diesel models are available now, the Skoda Scala A1.0 G-TEC with environmentally friendly CNG (compressed natural gas) drive will follow in 2019. The engine features direct injection as well as a turbocharger and fulfils the Euro 6d-TEMP emissions standard. It also comes with brake energy recovery and Stop/Start technology. ŠKODA says the 1.0 G-TEC delivers 66 kW (90 PS) and provides the most environmentally friendly way to drive the SKALA.